We have had a few tea kettles over our lives but I have to say this is the best one we have had yet. I love how heavy this is due to the copper bottom. 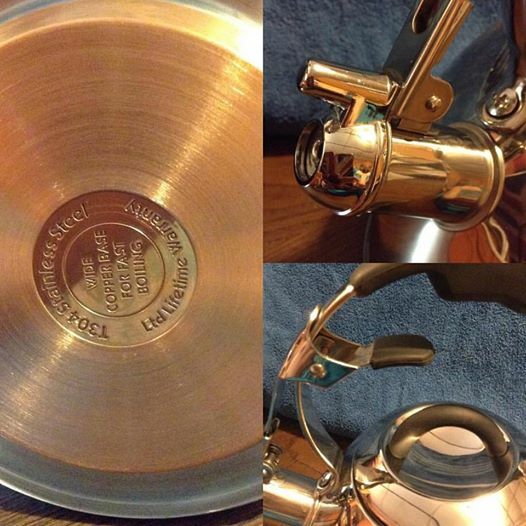 I have seen others say they have a copper bottom and they really just have what looks like copper paint on the bottom. This is actually a copper plate on the bottom. 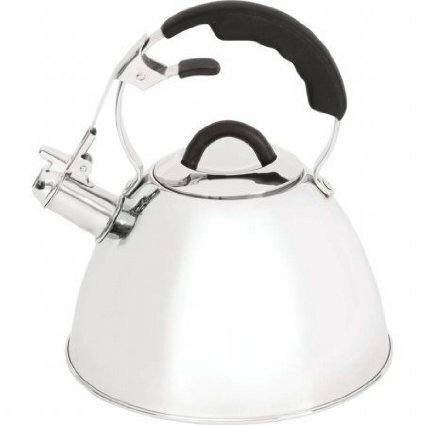 This tea kettle holds enough water for everyone to have hot cocoa, tea, or even for my husband to boil water for his French Press Coffee Maker. I love the handle and I love yes love again the trigger for the water spout. This is perfect for our families needs and looks great in our kitchen as well. I think I would be hard pressed to find a better kettle. The Chef's Secret Tea Kettle can be found on Amazon. What Chef's Secret has to say about their product. Features wide T304 stainless steel construction; 5-ply impact bonded capsule bottom; mirror finish exterior and interior; opening lever; lid with soft rubber-touch handle; ergonomically designed soft rubber-touch handle; and whistles when the water is ready. Limited lifetime warranty.